Feedback, Discussion, Comments, References: How to Suggest Changes, References, and Improvements. Note -- This image is in a file format that is not ideal for high-quality printing. If you would like to print this, please jump down the page below the image to download a high-quality PDF file, formatted for high-resolution printing on large-format paper. At first glance this wall chart looks like a complicated web. However, as a conceptual summary, in one view, we can see how most biogerontological processes relate to each other. Importantly, examination of these relationships allows us to pick out reasonably plausible causal chains of events. Within these chains, we can see age-related changes (or accumulations) that appear to be promising targets for future therapy development. Especially harmful is damage to the body's regeneration and repair systems, because they normally repair damage to other structures and systems. Repairing the repair systems should receive high priority in planning the development of new therapies. An important example is age-associated accumulation of lipofuscin inside the lysosomes inside neurons. This can block autophagic removal of damaged structures inside the cells. In this chart, we can follow several important pathways from age-associated causes down through the age-associated pathologies that result. This symbolic diagram is not really a picture of a cell. It changes in scale from molecular events at the top, through whole cell activities in the middle, to tissue, organ, and whole body diseases at the bottom. Thick horizontal borders separate transitions in scale. Intracellular events are described on the top left. Extracellular matrix and blood are described on the top right. Colors have meaning, as indicated in the "Color Key". Shapes have meanings described in the "Shape Key". Solid boxes represent physical materials. Slanted-roof boxes represent increase or decrease in quantities during aging. Hatched boxes represent activities or processes. Thin arrows represent causal sequences of events. Thick arrows represent physical transport or movement. A circle with an "X" inside represents inhibition of the indicated process; this might mark a candidate target for therapeutic intervention. Tags pointing in from the far left and right represent environmental factors or interventions or hypothetical interventions. [ https://LegendaryPharma.com/amazon ]. Starting here will not interfere with signing in to your existing Amazon account. It will take you to your usual account. You will get your usual low prices, shipping, lists, and services. Please click over there now and bookmark it for future use. As an Amazon Associate, we earn from qualifying purchases. John D. Furber. 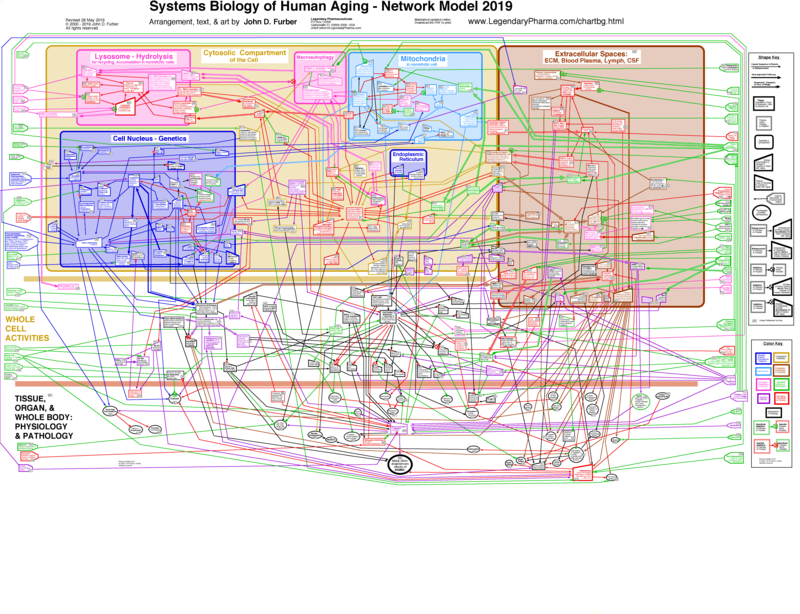 Systems Biology of Human Aging - Network Model Wall Chart. A good, short review of aging mechanisms was published in the journal, Nature by Jan Vijg & Judith Campisi. (2008) Puzzles, promises and a cure for ageing. Nature, 454, 1065-1071. Accelerating Future blog by Michael Anissimov, 18 Oct 2010. This network model was one of several which formed the basis of discussion at the Symposium on the Systems Biology of Human Aging at the National Institute on Aging, Baltimore, Maryland, 8-9 December 2009. Science and health writer Joyce Wall featured this network model in her article, "Aging and Antioxidants: finding a magic bullet in a biological battlefield of free radicals", Examiner.com, 25 October 2009. This network model was one of several which formed the basis of discussion at the Symposium on the Systems Biology of Aging at Arizona State University, 6-7 December 2008. Louisa Dalton featured this network model in "Assembling The Aging Puzzle: Computation Helps Connect the Pieces," Biomedical Computation Review, Spring 2008. Science fiction writer Bruce Sterling reviewed this Systems Biology Network Model of Aging Wall Chart on his Wired blog, "Beyond the Beyond" November 18, 2007. The link "https://grailsearch.org/?q=node/50" is no longer active. You might try the Internet Wayback Machine, if interested. Please see the next section to download the file and have it printed in large format at your favorite print shop. Artist signature: Upon request, the artist will autograph your copy. Sponsored Printing: Your organization or company can cover the cost of printing a batch of posters on large-format paper. An acknowledgment and your logo can be printed on the posters. This will lower the cost to scientists, students, and interested individuals. You can also distribute posters directly. You may print a single copy of this network diagram for personal or educational purposes. You must agree to keep all elements of the image visible together, including the copyright notice, web address, and creator's name. Please send a Royalty or Donation of $5 per print to support this ongoing work. To pay by check, please send email to JohnFurber at LegendaryPharma com. You will receive an email with instructions on where to send the check. To pay by PayPal, please email for instructions. But wait! Do not download the image displayed above on this page; it is in a file format that is not ideal for high-quality printing. Please see below to download a high-quality PDF file, formatted for high-resolution printing on large-format paper. This PDF is set for You may adjust your software to print a larger or smaller image, to match your printer paper size. This is a scalable, vector-graphic PDF. Also download the file "chartintro.pdf" formatted to print the explanatory information on 8.5 x 11 inch paper. After you put up the poster, please send an email to tell us where the poster is displayed, and please email a photo of the chart on your wall, with you and your associates beside it. We will be starting a web page of photos from labs, classrooms, and clinics around the world. This symposium was a joint meeting with The Spanish Group for Research on Free Radicals, The Portuguese Group of Free Radicals, and Le Soci�t� Fran�aise de Recherches sur les Radicaux Libres. Also supported by the Society for Free Radical Research International. Hunan Normal University, College of Life Sciences (Changsha, China, 2 December 2010) Invited lecture. Linköping University, Department of Pharmacology, (Linköping, Sweden, September 2007) Invited lecture. Linköping University, Department of Pathology, (Linköping, Sweden, October 2002) Invited lecture. Please Send feedback, suggested references, and suggestions for improvements: Please email us if you see errors to correct, or if you can suggest ways to improve the clarity or utility of this Network Model as a tool for teaching or research. If you suggest a reference, please identify the box or boxes to which it applies (and the DATE version you are looking at), and a brief (1-3 sentences) summary of how this reference applies. Please also tell us if you are using this chart in your classroom, research institute, or clinic. Write johnfurber at LegendaryPharma com. © 2010-2019 by John D. Furber. All rights Reserved.